Let California Casualty help you stop paying out-of-pocket for school supplies and instructional materials. 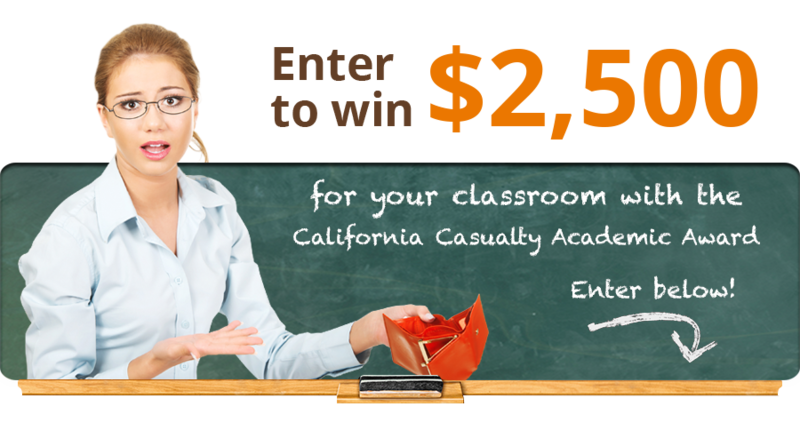 Enter to win $2,500 for your classroom! Tell your colleagues about this opportunity! School information used only for verification. Teachers regularly have to seek out grants and free resources to meet the educational needs of their classrooms. We created this award to help teachers get the supplies they need to educate future generations. By submitting this form, you are entering the Calcas Academic Award Giveaway and granting us permission to contact you from time to time about our contest, products and services. * A contestant must be an active employee of a K-12 public school, a current member of the AEA, CTA, NEA (National Education Association), or referred by a current member of the state NEA affiliate or one of our other participating educator associations including: ACSA, CASE, COSA, KASA, NASA, UAESP or UASSP. Read the California Casualty Academic Award Press release here.